Among the Orosini tribe, the traditional manhood ritual begins three days before the Midsummer's celebration. Alone, the child must survive the wilderness. Kielianapuna - red squirrel - is struggling. Despairing of his future, he returns to his village, where devastation awaits him. Brand new epic fantasy from the master of the genre. Among the Orosini tribe, every boy must undergo the traditional manhood ritual in order to understand his place in the universe and discover his manhood name. Kielianapuna must survive on the remote mountain peak of Shatana Higo until the gods grant him his vision. But Kieli has already waited for four days and nights, and now he is cold, lonely, despairing, and very, very tired...When he is woken by the terrifying sensation of sharp claws piercing his skin and finds a rare silver hawk upon his arm, it is such a disorientating moment that he is not sure whether it has even happened, or whether it was a vision. Returning to his home, nameless and still a child, Kieli stumbles upon devastation. His village is being burned, his people slaughtered. Although it means certain death, Kieli throws himself into the battle...Against all the odds, he survives, alone of all the Orosini, who have been cut down where they stand: every last man, woman and child. A distant voice echoes in his mind: Rise up and be a talon for your people...The visitation of the bird on Shatana Higo was indeed his naming vision. He is a boy called Kielianapuna no more. 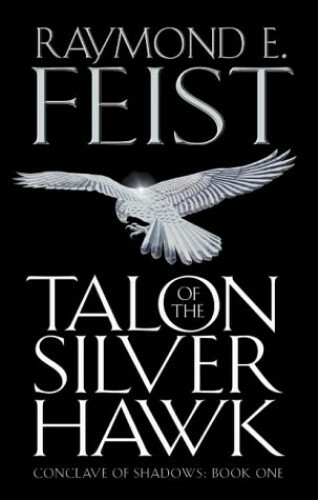 Now he is Talon of the Silver Hawk, a man who must avenge the murder of his people, whatever that may take...TALON OF THE SILVER HAWK begins a sweeping new epic fantasy series from worldwide bestselling author Raymond E Feist and marks the 20th year since the first publication of his first novel, MAGICIAN. Featuring one of the most fascinating characters and scenarios ever created in the genre, THE CONCLAVE OF SHADOWS promises to become one of the great all-time classics in the field.